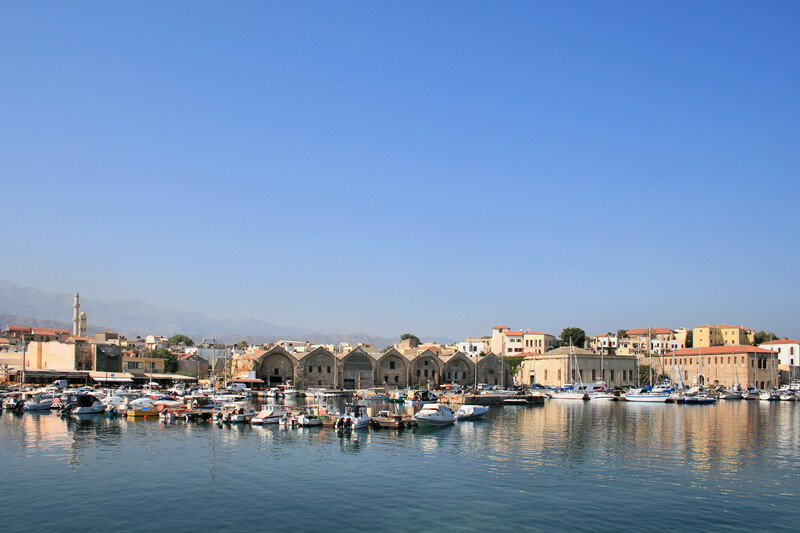 A remnant of the Venetian rule in Crete, Old Venetian Harbor sits at the heart of Chania's old town. Although this part of the city suffered massive damage during the bombing raids of World War II, the medieval harbor remains one of the most picturesque urban districts on the island. This old waterfront neighborhood contains some of Crete's finest Venetian mansions, restored and upgraded in the last few decades to accommodate boutique hotels, trendy restaurants, and elegant bars. The remains of the Venetian city walls frame a network of narrow backstreets extending from the harbor, where you can often find local artisans selling handmade crafts. Using our custom trip planner, Chania Town attractions like Old Venetian Harbor can form part of a personalized travel itinerary. This Venetian Harbour, with your lighthouse and Bay and the monastery is in itself a great reason for a visit, after the trade and restaurants throughout the port which invite us to rest, sit down for a minute and appreciate this almost natural. The streets of the old town very picturesque and embellished with flowers are also a reason for a visit of at least an afternoon or an evening for dinner to the sound of the sea. Attention restaurants are expensive and profiteers and parking is better looking a bit withdrawn, 10 m walking and are already places. One of the most beautiful "built" up areas... Get the bus into Chania and walk in, soak up the locals drinking their frappe, and join them in enjoying the stunning views of the marina. Remember to detour off the beaten track and get lost in the stunning back streets of the Old Town. This is a must see if you are visiting Chania. There are some very nice restaurant in the area, and tourist shops to visit. The restaurants are very close to the water in the harbor. There is also a Maritime Museum to see in the area. I have been to create 6 time and have came to walk the harbor every time. Every day, we help thousands of travelers plan great vacations. Here are some tips on how to use your Listing Page to attract more travelers to your business - Old Venetian Harbor. Promote your permanent link - https://www.inspirock.com/greece/chania-town/old-venetian-harbor-a8133091087 - on your website, your blog, and social media. When a traveler builds a plan from this page, the itinerary automatically includes Old Venetian Harbor. This is a great way for travelers looking for a great vacation in your city or country to also experience Old Venetian Harbor. Promoting your link also lets your audience know that you are featured on a rapidly growing travel site. In addition, the more this page is used, the more we will promote Old Venetian Harbor to other Inspirock users. For best results, use the customized Trip Planning Widget for Old Venetian Harbor on your website. It has all the advantages mentioned above, plus users to your site can conveniently access it directly on your site. Visitors to your site will appreciate you offering them help with planning their vacation. Setting this up takes just a few minutes - Click here for instructions.